I am proud to announce our first pistol training class of the year, and it is going to be a good one! 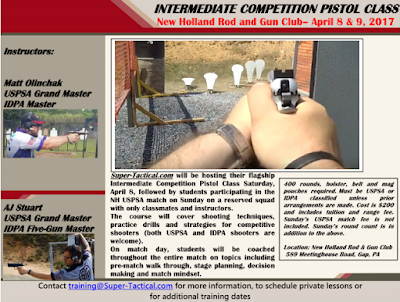 This is a two day format on April 8 & 9, with day one being our Intermediate Competition Course taught by myself and AJ Stuart followed by the entire class squadding together for the New Holland USPSA match the following day. We'll be talking strategies, stage breakdown and mindset for the duration of the match. Come join us! Just read your article. Good one. I liked it. Keep going. you are a best writer your site is very useful and informative thanks for sharing! Known as the "kayak fisherman's issue," how would you oar and fish while on a kayak? With just two hands, how would you hold your angling pole bar and move your kayak? best Tactical Backpack.